Who knew I could run a business in my home with two furry four legged creatures as my employed staff? 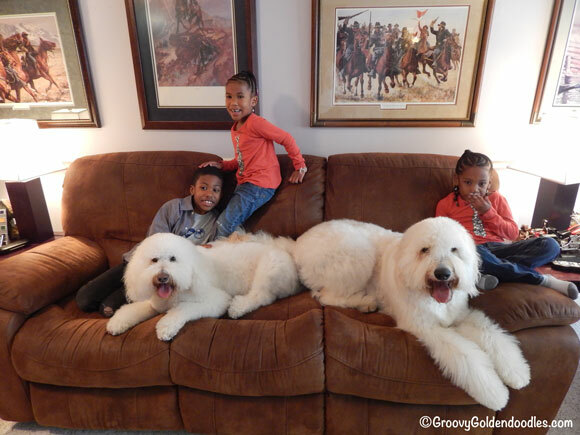 Who knew I had the pawfect childcare providers already in place? Well I sure didn’t – at least not until Saturday. 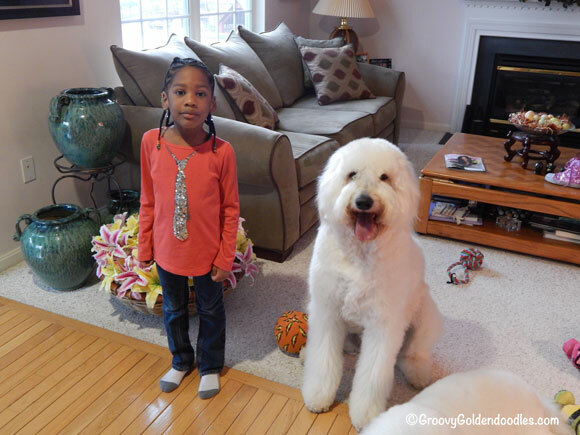 Payton became a ward of the Doodle! Pawhaps he and Harley could sense she was the youngest in the pack. Between the two of them, the poor girl was never alone. They tag teamed her. 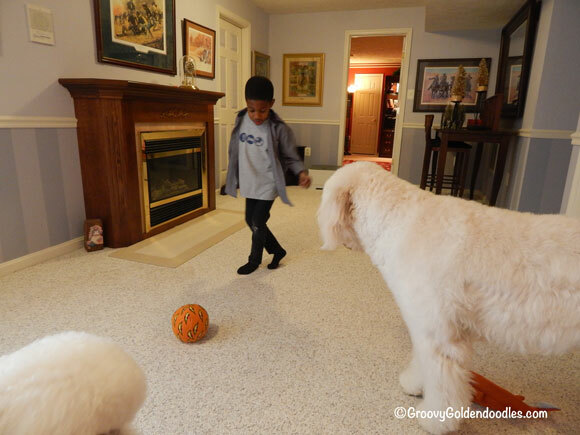 Leo wanted to learn some “Doodle-cool” soccer moves from six year old Xavier…. Now I know I said earlier that there were “three children” coming over – right? 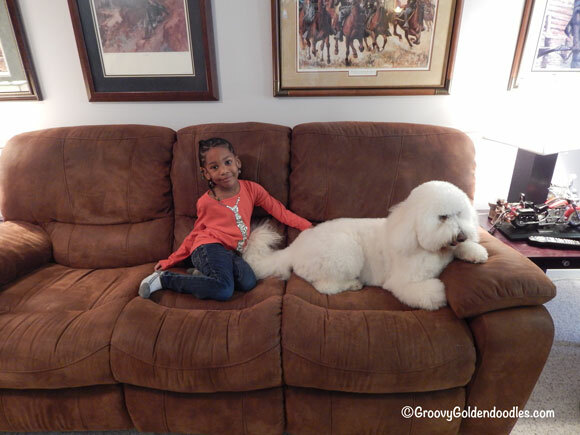 Upon entering the house, five year old Maya wasn’t 100% on board with these “Doodle sitters.” In fact – she spent the better part of the first hour “behind” me in the recliner. And that’s okay. I wanted her to adjust and become comfortable at her own pace. But when I say she sat “behind” me, I mean just that…. 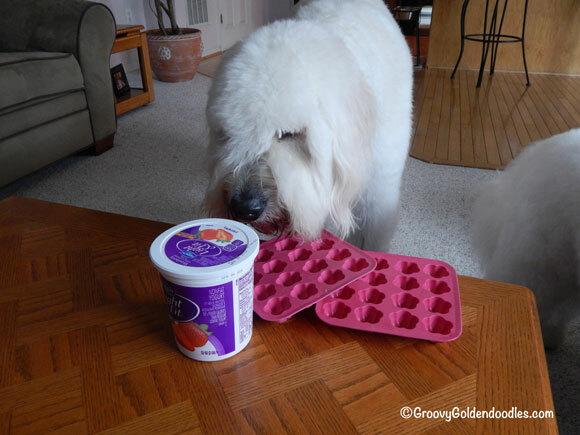 A pawfect time to make some homemade Yogurt treats we learned about from our furrend: Spencer the Goldendoodle…. And that’s when it hit me! 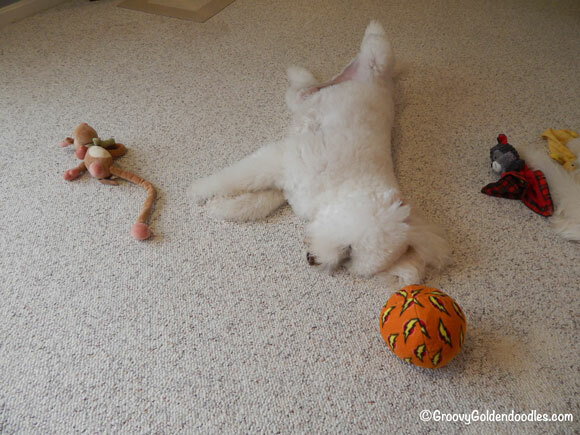 I could open up a DOODLE DAYCARE…. Thanks for reading! Make this the best week of your life, and share some Doodle love along the way…. Ann, Harley snored like he was working on the railroad. I can’t wait for them to come back when the weather get’s better. I’ll sit outside and let them roll around on the backyard, all day long! That looked like a fun day. 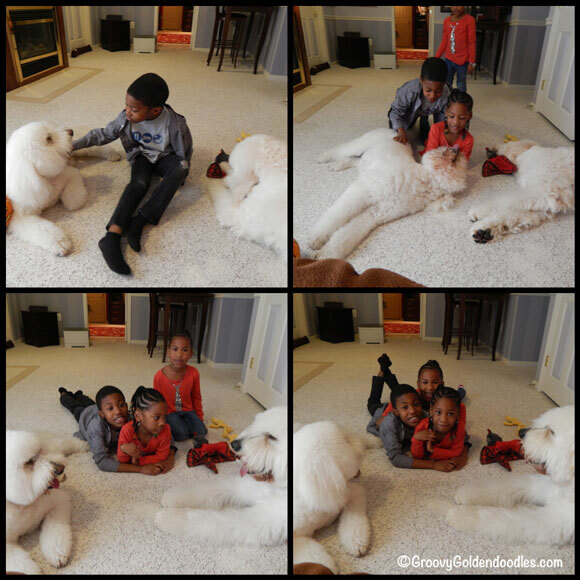 The best four-legged babysitters ever! Yes Tiffany, they certainly are! 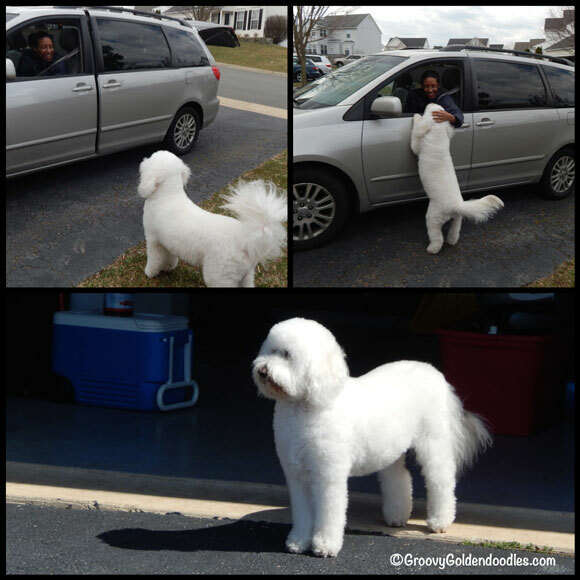 The treats seem to be more popular after a good long walk or a romp in the yard. Leo chomps his down frozen but Harley prefers to watch his melt a little on the bowl (or my hand) before he devours it. I’m sure in warmer weather they will be incredibly refreshing. Missed it all. Oh well, next time! They’ll be back Doodle Dad, trust me, they’ll be back! Oh my gosh – what a fantastic day. 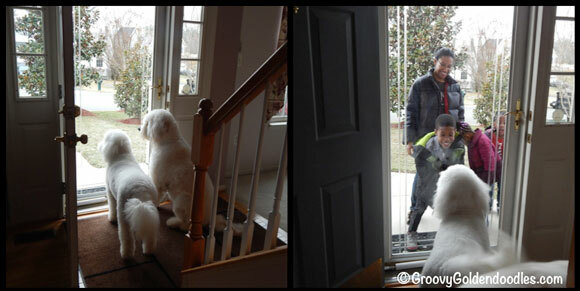 And Harley not wanting them to leave at the end, with that sad face, is simply adorable. 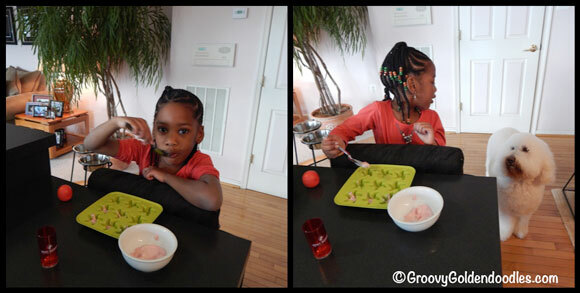 Payton and Maya have such adorable shirts (not to mention they are simply the cutest kids). The party was definitely at your house!! Jen, Harley hates for people to leave, he will really perform and try to get you to stay. The girls are always dressed to match and they are always looking adorable. Xavier is fashion conscience too, he prefers to focus on his jeans and sneakers! Yes, it was a great morning, we will definitely do it again soon. Looks like a fun time. 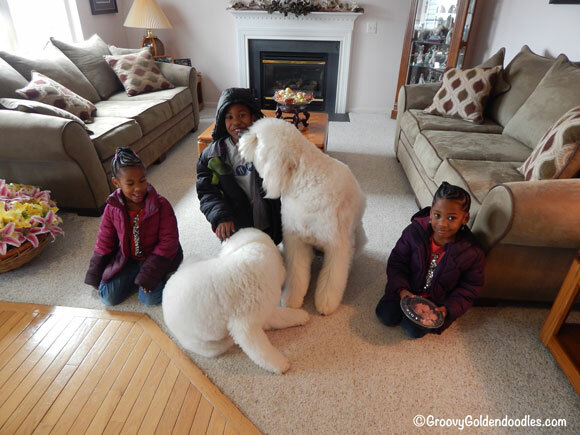 Kids love my sister Katie because she is big, white, soft and fluffy. Kids are a bit scared of Bailie and I as we can be a bit wild and sometimes jump up. 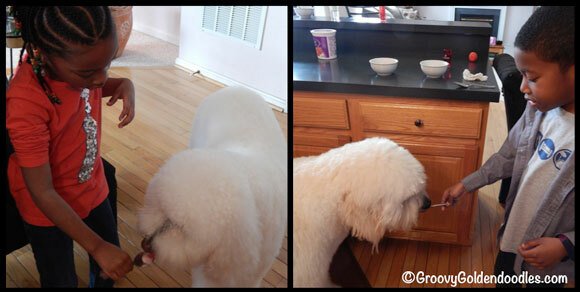 Hope you got some of your yogurt treats and they didn’t all go to the humans! Surprisingly no one was terribly afraid Emma. 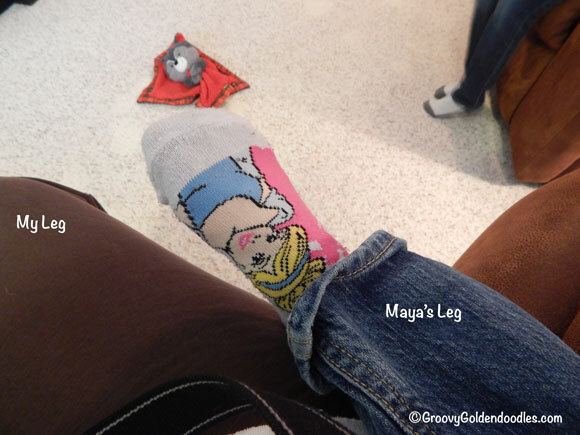 Maya took a few minutes to warm up to Leo because of his size but after that she was fine. The yogurt treats are in the freezer. There’s a whole bowl full so if you’d like some let us know. What a fun time – thanks for sharing all the pics. Poor Harley – he’s misses all his playmates huh? The “Doodles house” is the party place! For kids and the kid at heart !!! What a wonderful day for them The photos are fantastic! The Doodles look like they’d make great “readers” for the kids–the way their attention didn’t stray. 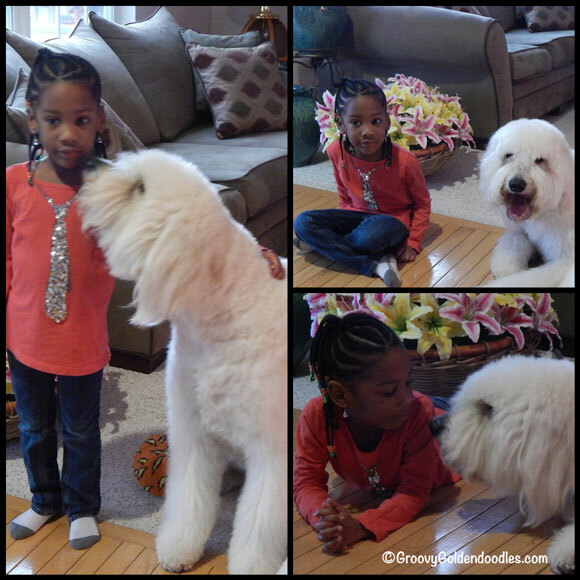 Next time, break out the books & get photos of the kids reading to the Doodles, please? 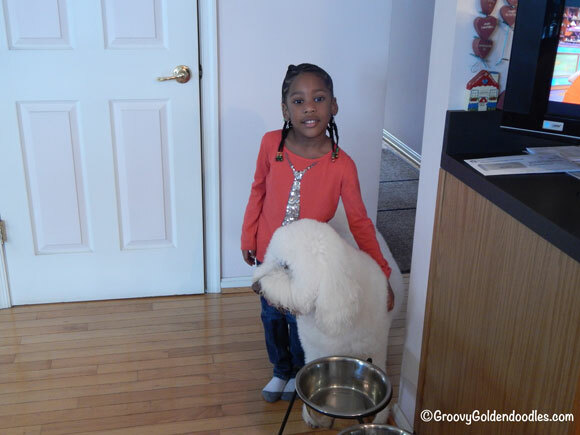 Nothing’s sweeter than to watch a child reading to a dog. 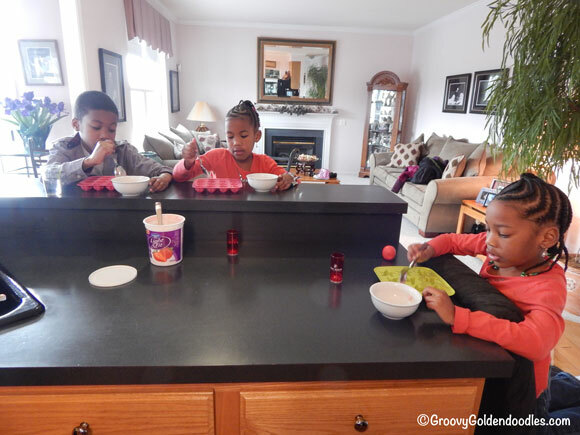 How fun that everyone was able to make some treats together! I love when things work out this way! Jen, it was a really nice way to spend a Saturday morning. Doodle Dad had a meeting and he was truly “bummed” when he read the post. He said he needs a “do over” so he could participate in the fun.